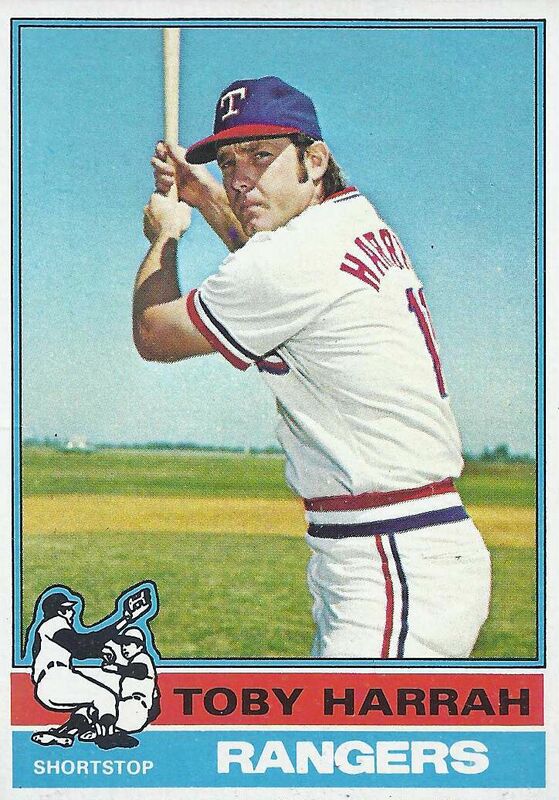 Texas Rangers Cards: 1976 Topps - Toby Harrah. 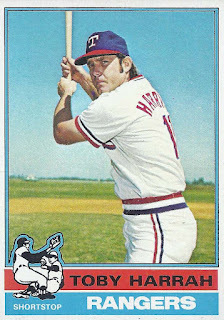 Toby Harrah, shown here on card 412 of the 1976 Topps set, nailed down the starting shortstop position in 1976. In 155 games Harrah would play 1,318.1 innings at short as compared to just 45 innings at third base. Aside from a few games as the designated hitter those were the only two positions Toby played. With a .955 fielding percentage at second (12 points below league average) and a .923 fielding percentage at third (30 points below league average) it was clear that Harrah wasn't making his way in the world with his glove. Unfortunately for Toby, his bat also developed some problems. In 688 plate appearances his batting average came to just .260. That was a 33 point drop from 1975. His on-base percentage also dropped by 43 points to .360. The one thing that didn't drop significantly for Toby was his power. He hit 21 doubles, 1 triple, and 15 home runs. In spite of the drop-off season Harrah was still selected to the All-Star team for a second straight year. That was probably due to the previous season's performance. Toby needed to get back to his 1975 form if he wanted to keep going to the midsummer classic.